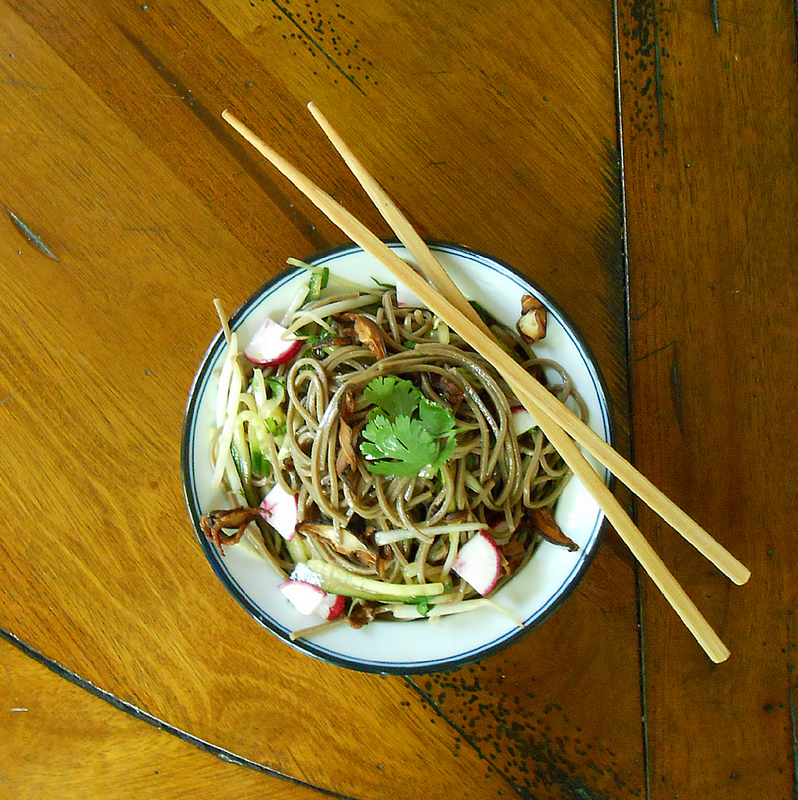 Our summery soba noodle salad is inspired by the Buckwheat Cold Noodles at one of our favorite standbys: Xi'an Famous Foods, a small chain of New York City restaurants that serve uniquely craveable northwestern Chinese food. We first made this crowd-pleaser for a potluck, where it easily outshone all competing dishes. It's an excellent choice for summer parties because it's inexpensive, vegetarian-friendly, easy to transport, and palatable both cold and at the inevitable room temperature that awaits all potluck food. For this recipe we've scaled down the amounts; turns out it's just as pleasing for a crowd of two. 1. Cook noodles in rapidly boiling water until al dente, about 6 minutes. Drain and rinse thoroughly with cold water until cool. 2. Meanwhile, to prepare optional shiitake garnish, heat canola oil in skillet over medium high. Add shiitakes and salt and fry until browned and crispy, about 6 minutes. Remove from pan with slotted spoon and drain on paper towels. 3. Whisk together horseradish, sugar, light soy sauce, dark soy sauce, and Chinkiang vinegar until sugar is dissolved. Whisk in chili oil and sesame oil. 4. Toss noodles with dressing, bean sprouts, cucumber, scallions, and cilantro. Serve chilled, topped with crispy shiitakes, radish wedges, and whole cilantro leaves. Take pleasure in knowing your dish is obviously superior.